Do you have random things that you Google once in a while? I do. One of them was my search for the lyrics to a song that I learned at Increase Miller Elementary School, written by one of my teachers, Mr. Kahn. In the past I’d looked online and even contacted the school looking for the lyrics, to no avail. But recently I found a group on Facebook that was formed just to remember all the lyrics. Yes-the song is that good. It’s a catchy little ditty called “The Presidents Song,” and if you learn it, you, too, “can name all the Presidents/All the White House residents/Of the United States.” Hooray! I was so excited to find it. I don’t know how to write music, and I wish I did. But if you know me, I’ll sing it to you. My kids love the song. And I’ve used it for years to remember the order of the presidents, even though things got murky around Millard Fillmore. UPDATE: The Facebook group that I’d found has dissolved, as not-so-active FB groups do. But we’ve located music! Dave offers to email you a copy in comment #14 below. Thanks, Dave! William Henry Harrison died too early. . . or came too late. Zachary Taylor, Millard Fillmore, check any history text. When he was gone, came Andrew Johnson, then U. S. Grant. Rutherford Hayes, then count the days of James A. Garfield’s run. Chester Arthur followed right after, then Grover Cleveland won. Again he ran to be the only man with split presidential terms. William McKinley’s luck spread thinly, shot by a mad man’s gun. Theodore Roosevelt ran two terms and William Taft for one. And after Calvin Coolidge, we had Hoover’s landslide. When John F. Kennedy died in Dallas, next came LBJ. Gerald R. Ford, then James Earl Carter suckered by Iran. George Bush cracked the whip on Iraq, but couldn’t drive out Saddam. “W” Bush next, then Obama, first president who’s black!
. . . Now, that’s what I call a teaching legacy! In other news, my struggles to enjoy the many offering of my CSA continue, and I have to strongly recommend the Grilled Coconut Kale that I found in an old New York Times Magazine. It is seriously tasty. I took this picture, then sat down and ate this entire plate. When I was grilling I was concerned about burning it, and when I make it again, I won’t be so fretful. The slightly-more-done pieces were absolutely the tastiest. Update: I made more of this and presented it to my family with great fanfare and enthusiasm. . . . Alas, no one else was particularly thrilled with it. And by not “particularly thrilled” I mean that perhaps there were some muted gags. But I swear, it’s delicious. 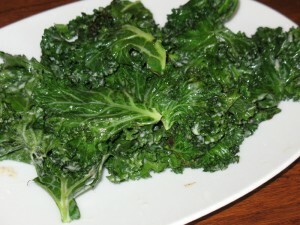 The kale chips, just baked with some olive oil and season salt, were more popular with the rest of the family. Please sing the song to us! Next time I see you, absolutely. I have an awesome recipe for a gratin with kale and navy (or cannolini) beans. Sooooo yummy. Now, do your girls eat it? If so, I need the recipe. Pretty please. Thanks for the lyrics to the president song. I too learned it in elementary school. Not sure who the author is because the last verse I learned was “Richard M Nixon, Gerald R. Ford, right to this present day, who the nation picks in ’76 your vote will say ” so this was in 1975. @Maureen–yeah, I’m sure it was Mr. Kahn. He used to rewrite it as they were elected. So the very last line of this one is mine. Have no idea what we’ll all do in 2016! Thank you for posting The Presidents Song . Been looking for the lyrics for quite some time . Mr. Kahn was my teacher in 1974 – 75 . I remember him fondly . @Earl, my pleasure! Except I don’t know what we’ll do next time, because we’ll need a whole new verse. . . .
We Sang it at North Salem too. Could you give me the link for the facebook page. Anyone find the music to it? @Jeff, I think that the FB page faded out. Generally speaking, if a FB page is inactive for a while, they’ll dump it, and when I tried to look for it again the last time, I couldn’t find it, so I suspect that’s what happened. I remember the song, a brilliant piece of music & lyrics written by a brilliant, creative man. Jeff Kahn, Mr. Kahn, proved to many of us over many years just how influential a great teacher can be. I learned this song at PQ in North Salem (1981-1985) from Chuck Thatcher. To help teach it to my own kids I decided to transcribe the tune. With help from an old PQ friend with musical talent we now have the sheet music with new lyrics from Bush to Obama. If anyone would like a copy feel free to contact me at deehmann@gmail.com. HI! I Just sang this song to my son last night (of what I could remember!) So loved that song from Mr. Kahn’s class… I was in his homeroom at Increase Miller in 77-78… I would love the music as well. What a great teacher he was to have made such an impact on his students through his love of music! Be well all! mrs. head was my music teacher in lewisboro elementary and she taught us this terrific song…my twins love it and when we forget what name comes next, we look at our placemats with the presidents on them…thanks for posting! I just found your blog and these great lyrics to Mr. Kahn’s Presidents Song! Thank you so much for posting them. I was a 6th grader in Mr. Kahn’s class in 1979-80. He was definitely one of the best! I have been looking for this musical version of this song for a while. I had and loved Mr. Kahn in 5th grade in ’93 and remember this song! I used to have a tape of him singing it, but no longer do. I teach 4th grade and taught my students the states song he sang to us. Wish I still had his tape of this song. He was the best! OMG! I loved this song as a kid. I could only remember the first line, so I was trying to google it to see if anything came up. It was from Mr Kahn, he was a very favorite and memorable teacher. Glad I found this! Thanks! Dear Katie – I am OVER THE MOON to have found the words to this song. I tried to find the lyrics a few times over the years with no success…until today! I learned the song in music class in Cold Spring Harbor, NY…circa 1975. I remembered the chorus and the first verse, but was stumped as the to rest of the lyrics. I am a school librarian in a K-5 school in Livingston, NJ. You made my day. I sang it with a bunch of 5th graders today. Awesome! @Sheila, glad to hear it made your day! So glad to find the lyrics and remember this tune. I’ve mostly remembered it all these years, tho never all at once… that is, one verse will come to me one day, then another on a different day. I recall gathering (in Mr. Craffey’s room I think) to sing it for a recording Mr. Kahn was submitting to a bi-centennial song-writing contest. Good times. I’m sad to hear of his passing. Hi…I am not sure if this blog is still current. However, I found it due to a google search for the President’s Song which is presently being used on the Jeep Cherokee President’s day sale promotion!!! My son had Mr. Kahn in the 6th grade…thinking of him brings back the best memories. It is wonderful to hear his song…but I do think that this is an infringement on copyright and if Mr. Kahn has living relatives, perhaps they should be alerted if they haven’t already been. Anyone know how to go about doing this? Thanks for the blog and the words to the song. What year did you go to Increase Miller? Oh, my goodness. . . I guess it would have been 1980-1983? For a while, several years back, there was a Facebook page devoted to trying to remember what the exact lyrics were, but then when a page becomes inactive for a while it disappears, and I suppose that’s what happened to this one. And one of the commenters had a pdf version with the music and slightly different lyrics–I think he listed his email in the comments if you’d like him to send you a copy. Mr. Kahn was my 6th grade teacher in 74-75. We would sing the President’s Song over and over as he recorded us on a cassette player so that he could enter it in a songwriting contest. i learned this song in west orchard elementary school in New York State like 25years ago! Glad to know it did!! Does anyone have this song uploaded?? Not that I know of; sorry. If you ever find it, I’d add a link. I’m so excited to find this song. I learned it in the late 70;s in Orlando, Florida by my history teacher, Mr. Godfrey. I thought he told us he wrote it. I know Mr. Godfrey is no longer with us and I’m elated to find the song. Thanks for sharing it and I love the ending! Thanks for posting this! I was in Mr. Kahn’s class in 1983-84 and always hummed along and faked it after the 2nd verse. I used the version of the Presidents Song written by Mr. Kahn when I taught in Orlando. I would love to have the words and music if anyone has it. Thanks so much. And who is the Debbie that I taught? Omg! Can’t believe all these people remember that song! That’s great.I too had mr. khan loved him great teacher. And loved the song. Wow what a blast from the past! Mr Kahn was the best! I was singing this to my daughter today and had to google it to find the lyrics! I love that I found your page. I learned this in school in S. California from a teacher that got it from another teacher (perhaps that was Mr. Kahn). I’ve been trying to find the chords for the music so that I can strum it on my guitar. And, I still have the physical copy from ~1989. @Chris, I think if you look up through the comments someone had offered the music if you email him.